Heterogeneity in the presentation of diabetes mellitus has been recognized for many years. It was long considered, for instance, that the form of diabetes occurring in children, adolescents, and young adults was basically different from that appearing in older adults and elderly patients. As a consequence, juvenile-onset type diabetes and maturity-onset type diabetes were long opposed. This classification, based primarily on age at onset, was progressively abandoned when it was realized that some children aged 15 or less had all the typical characteristics of “maturity-onset type diabetes” and, in contrast, that some patients aged 75 or more had the features of “juvenile-onset type diabetes.” Similarly, it was long implicitly considered that overt diabetes was preceded for some months or years by an intermediate state during which fasting blood glucose was normal but postprandial blood glucose higher than normal, particularly when an oral glucose load was used as a provocative test. For many years, patients exhibiting an abnormal oral glucose tolerance test were labeled as having “chemical diabetes”. 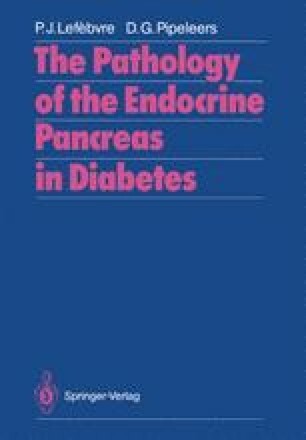 However, long-term studies performed in such individuals eventually revealed that, in a large percentage of them, overt diabetes failed to appear even after 25 or 30 years of consistently abnormal blood glucose levels on serial oral glucose tolerance testing. Labeling someone for 30 years a “chemical diabetic” when he or she will never become an “overt” or “true” diabetic is probably not scientifically sound, and certainly not psychologically and socioeconomically acceptable.